Christian Capitalism: S&P 500 Headed Up! The blue line is the actual average for the quarter for the S&P 500. The red line is the lower prediction interval and the green is for the upper. The two intevals show a dip for the fourth quarter but a recovery in the first quarter next year. I'm betting that any dip in the market in the fourth quarter will be smaller than forecasted. I added the PE ratio and improved the model’s quality considerably. The former model used only profits as predictor variables, but profits are far more volatile than the market. One would think the opposite, based on mainstream economic theories such as the efficient market hypothesis (EMH) or behavioral finance. EMH insists that deviations from the net present value of future returns are irrational while behaviorists think that the market follows greed or fear. The data show that both are wrong. 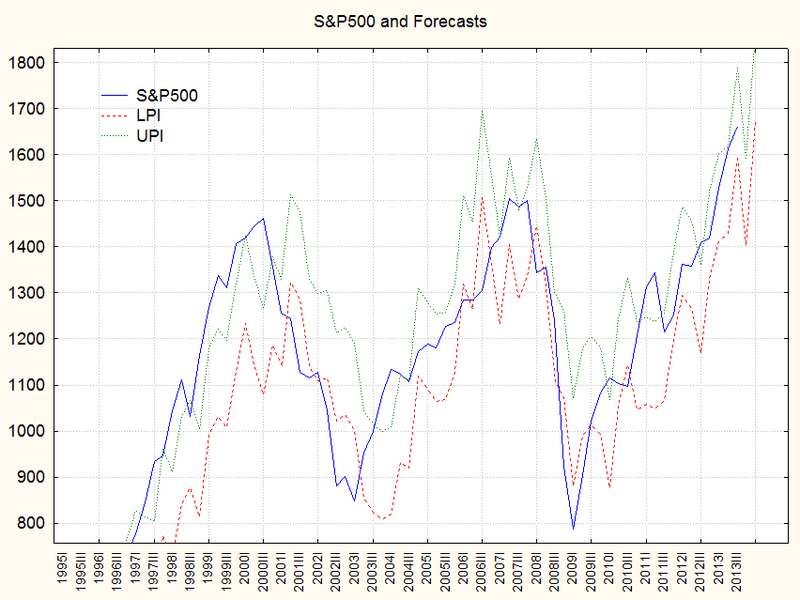 Profits are volatile and investors are doing their best to forecast what they will be in the near future. Forecasts should change as the data changes. Stock prices change less than swings in profits from quarter to quarter. Part of the reason is risk tolerance. The price/earnings ratio (PE) is essentially a measure of risk tolerance. In recessions investors have less tolerance for risky stocks and in the expansion they have a much greater tolerance so the PE ratio falls during recessions and rises during expansions. The PE ratio in the model dampens the volatility of the forecast compared to the model with only profits. As you can see from the graph, risk tolerance and PE ratios got out of hand in the bull market of the late 1990’s. That's evident from the fact that the market rose higher than profits and PE would predict. The quarterly average PE peaked at 46 in the first quarter of 2002. Much of that came from mainstream economists proclaiming they had solve the business cycle problem and from talk about the “new economy” and how high tech would change the world. But most of it came from ridiculously low interest rates. Several academic papers have shown that investors become more tolerant of risk as interest rates fall. Some of that is a necessary, rational response by investors who depend on yield, such as retirees. Since they can’t get the yield in safe assets to provide the income they need, they are forced to take greater risks. I was talking to an investment adviser friend about how I learned in school that investors should lean heavily toward bonds as they near retirement. He told me that was true in the 1980’s when interest rates were reasonable, but as the Fed has destroyed the yield of safe bonds through its inflationary policies, investors have been forced to take greater risks to obtain the yield. A nice thing that the graph illustrates is that investors overall don’t take extremes in profits too seriously. They seem to understand the volatility and expect reversion to the mean. That shows greater rationality on the part of investors than many economists or financial experts are willing to acknowledge. The new forecast shows the average for the first quarter of next year turning up slightly. That means the downturn for this quarter will probably be mild and a chance to get in on the January effect when stock prices usually rise. There does not appear to be a good chance of a recession in the next six months. If you like to trade stocks more frequently than once a quarter, or you’re looking for an entry/exit point, think of “reversion to the mean.” The values on the chart are quarterly averages, which means that if the current price of the S&P 500 is considerably above the mean, which it is, it will likely fall or if it is considerably below the mean it will likely rise. 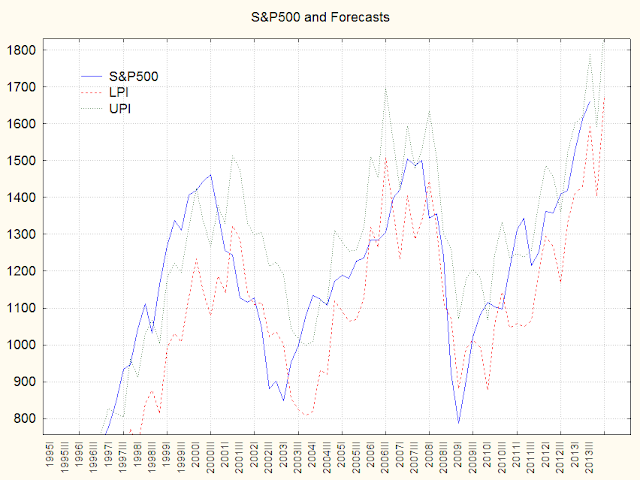 Currently the market is about 150 points above the forecast upper prediction interval this quarter, suggesting a pretty good decline is possible before Dec 31. Good investing!